MLB quietly modified its bona fide slide rule interpretation, issuing a clarification to Tigers Manager Brad Ausmus and providing a spokesperson's statement reflecting that the strict application of new rule 6.01(j)—the bona fide slide rule—has been relaxed concurrent with increased scrutiny applied to the defensive player's ability to turn a double play. A runner must now actually hinder and impede the fielder's ability to complete a double play in order for the DP to be awarded. 4) He slides within reach without changing his path for the purpose of initiating contact with a fielder. 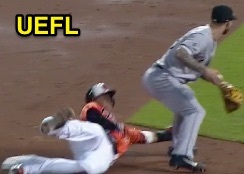 Not Impeded: Machado didn't hinder the turn? The circa-Opening Day penalty for failing to satisfy all four criteria was an automatic double play, a ruling and interpretation that manifested mere hours into the young season, when 2B Umpire Paul Nauert ruled an automatic double play for a bona fide slide violation: an overturned ruling in Tampa Bay effectively ended an Opening Series game by wiping out a Toronto lead and turning it into a Rays victory. Similarly, not a week went by without a neighborhood play being overturned for the fielder's failure to tag second base. 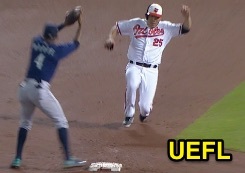 Even though the judgment was that runner failed to engage in a bona fide slide, the Replay Official must still find that the runner's actions hindered and impeded the fielder's ability to complete a double play. In the absence of the hindering/impeding element -- which is a judgment call -- the runner cannot be found to have violated 6.01 (j). The judgment on this one was that there was no hindering or impeding of the fielder. Did you catch that? The "new" interpretation about bona fide slides is that, "the Replay Official must still find that the runner's actions hindered and impeded the fielder's ability to complete a double play." In other words, the bona fide slide rule violation's penalty has changed from "automatic" to a more "nullify the act" approach that is more in line with other interference/obstruction calls. Yet unlike the 2014 Press Release and fanfare surrounding a new mid-season rule interpretation for catch/transfer plays, MLB has been fairly unenthusiastic about bona fide slides and neighborhood plays. Since Opening Week (April 8 and Dan Bellino's slide rule interference ruling against Houston), not one Rule 6.01(j) challenge has resulted in an interference ruling nor an overturned call. In terms of pulled foot calls at second base (the "neighborhood play"), the last out call that was overturned to a pulled foot (safe) ruling upon video review occurred in late April (Adam Hamari/Red Sox). Neighborhood Play Returns: So he's...out? In other words, the bona fide slide rule and neighborhood plays have not been overturned to interference or safe/pulled foot, respectively, since baseball's opening month. Yet it's not as if these types of plays have stopped happening. Tmac has been charting Replay Review decisions and noting when the New York decision appears to have been made in error (e.g., when video evidence indicates the call was missed and should have been overturned, yet the Replay Official failed to do so). Failed neighborhood play overturns have accounted for two of the four improper replay decisions since Ausmus received that clarification e-mail. Or, more bluntly, in response to the Orioles' question of, "don't you actually have to touch the base?" the answer these days appears to harken back to a more traditional time when the answer was simply, "no."